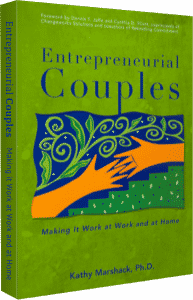 “Entrepreneurial Couples: Making It Work at Work and at Home” has been updated for today’s couples. Caught in the squeeze of trying to maintain two careers in today’s tough corporate climate, more and more couples are giving up their jobs in order to start their own businesses. Marshack examines the traps these couples can fall into and offers practical advice for dealing with them. For example, entrepreneurial couples with a full family life have greater potential for communication breakdown and interpersonal problems than do other couples. They often fail to confront issues head on, instead relying on compromise and other avoidance techniques to ward off conflict. “Decisions arrived at through compromise usually lack creativity and seldom last,” says the author. “It may be fine to compromise about choosing a restaurant for dinner, but compromising about your business can sabotage your competitive edge.” Trying to keep family and business issues separate is just not realistic, according to Marshack. To be successful as an entrepreneurial couple requires planning a life–a life that includes your personal and relationship goals as well as your career and business goals. Entrepreneurial Couples shows how to assess each area of your life and offers tips and twelve different exercises for brainstorming, creating contingency plans, achieving flexibility, and developing a successful life and business plan with your partner. To receive a complementary copy of a chapter from Entrepreneurial Couples, subscribe to our newsletter below. We’ll give you instructions to get your free download. Next PostNext Human Connection – A Lost Art?